buy now We often spend such time and energy worrying about “Purpose.” And indeed some of us do have a burning mission in life. here That’s beautiful when it happens, but what if your purpose isn’t clear to you? cheap generic viagra mail order pharmacy To me the Grackle’s message is to appreciate the beauty, magic and majesty of ordinary, everyday life. To honor one’s physical being and delight in the strength and power of the body as a divine vehicle for Spirit. buy now We are all a part of the body of Mother Earth. Our bodies, our blood: her soil and water sparked to life. Our breath and her air are one. Her fire burns in our souls. Is Wolf your Power Animal? I’ve been working on a series of Power Animal paintings in preparation for showing at the Hiawatha Music Festival Artists in the Round art & craft show next month in Marquette, MI. Thought I’d try another Wolf! Read on below for insight into Wolf as Power Animal. Wolves are one of those animals that humanity both loathes and reveres. I think it’s because they represent very intense energy, which can be extremely empowering to work with but also frightening, especially if you’re not prepared for it. Like most animal totems, Wolf has multiple meanings. Today I want to focus on Wolf as Hunter and Pathfinder. buy now Wolf represents following your intuition and inner guidance, and taking action on it. So if you are seeking your Purpose and Wolf appears to you, pay attention! As you know, Wolves are predators, tracking their prey by scent as well as sight and sound. They are highly intelligent animals. A pack of wolves will work cooperatively to bring down prey much larger than they are. Deer (and anything in the deer family, including elk and even moose) are their favorite prey. Deer are excellent runners. Bringing down such large animals requires speed, stamina and strategy. Once they have selected an animal to chase, they pursue it relentlessly until it is exhausted. Wolf as a power animal can help us discover our inner Purpose, and guide us on our path towards it. One of the keys to doing so is to tap into our intuition, or inner knowing. As a wild animal, Wolf has all its instincts intact. Wolf and Dog were originally one; dogs are simply domesticated wolves. (And there is good evidence that the process of domestication was likely initiated by wolves, not humans!) If you feel a strong bond with Dogs, but are struggling with some aspect of your life, you may want to invite Wolf to walk beside you as well. Its sharper, wild instinct may help you in ways that Dog energy isn’t equipped to. Yes, that wild instinct can be scary. As we tap into our intuition, we may find that it leads us into unfamiliar territory. In fact, it may tell us to do things that feel positively terrifying! This can make you doubt your own instincts. And in some situations, it’s possible for instincts to work against you – especially fear. In the wild, anything new is potentially dangerous. So we have a built-in distrust of change. Wolf represents the power of tempering instinct with intellect (and vice versa). When you make a decision based on instinct, check in with your intellect first. Ask, “what is the worst thing that can happen if I do this?” Then weigh the outcome against potential benefits. You can do the same thing with your logical decisions. Check in with your gut before jumping in. Learn to trust yourself. Like a wolf crossing a river in winter, you can tune in to those red-flag feelings that tell you to beware of thin ice. In the painting above, I’ve tried to capture the Wolf’s intensity of focus. The Wolf’s direct stare can be frightening, but it is also compelling. Wolf can help us zero in on our Purpose, and pursue it without allowing ourselves to get distracted. As you work with Wolf energy expect your intuition to grow stronger. You will probably become more focused on your goals and more determined in your pursuit of them. You may find that other people in your life resist this. Be sensitive to when they are being unreasonable, and when you might be getting a little ruthless or overstepping your role. If the latter, it might help to invite some Deer energy into your life. Gentle Deer can activate your heart chakra to balance out an overabundance of Wolf hunting energy. Or, focus on the nurturing side of Wolf for a while. Wolves are very family-focused. They spend a lot of time nurturing, playing with, and teaching their pups. If you’ve been working intensely for a while, try taking some time off to spend with your family, or seek out a teaching or mentoring role in your work. Speaking of which, Wolf also tells us that we are stronger and more successful when we work together towards a common goal. Whatever your goal is, look around you. You are almost certain to find someone whose goals complement yours. Why not see how you can help each other out? Author ChristiePosted on June 20, 2015 Categories Animal art, Spiritual, Wolf artTags deer, goals, power animal, purpose, spirit animal, totem, wolf, wolvesLeave a comment on Is Wolf your Power Animal? I was dabbling about in the kitchen tonight, when I suddenly thought of a friend. The word “sing” came to me, as it did when we first met two weeks ago. Then, a few moments later, the impression of a song bird. 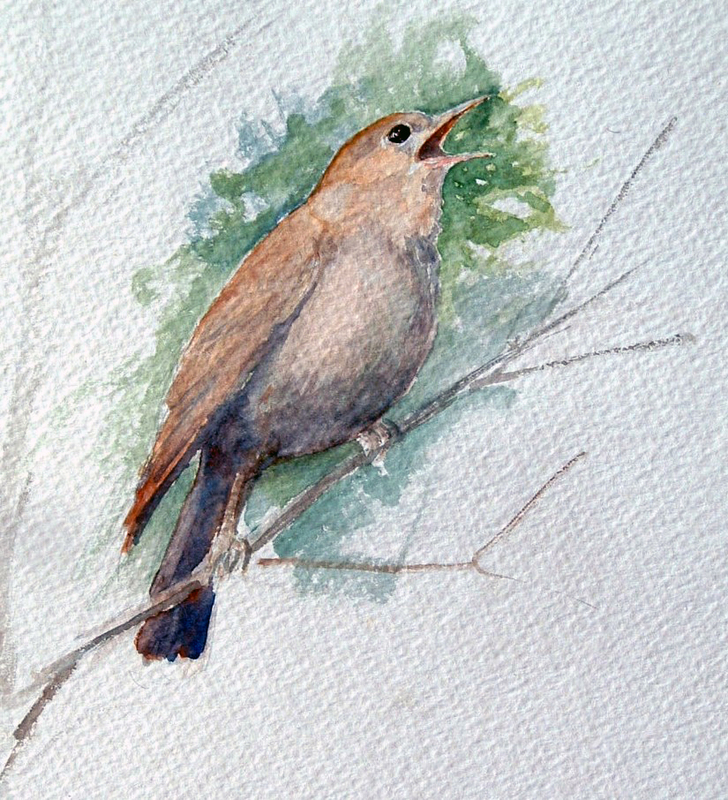 “Nightingale,” watercolor on paper. Collection Anne Michelsen. Be like the bird that, pausing in her flight awhile on boughs too slight, feels them give way beneath her — and sings — knowing she hath wings. This time of year some of the birds are already starting to stake out their territories in the woods – and singing to attract a mate. …and sing your heart out. If your wings aren’t fully developed yet, your song will help them grow!